Michael Vatikiotis is a member of the Asia Society's International Council and has a decade of experience working as a conflict mediator for the Geneva-based Centre for Humanitarian Dialogue. He is a former BBC journalist who has worked in Asia for over thirty years, living in Indonesia, Malaysia, Thailand, Hong Kong, and his current home, Singapore. 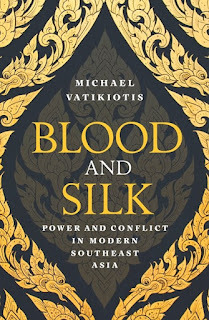 Blood and Silk: Power and Conflict in Modern Southeast Asia is in part his memoir and in part a political study of the dynamics of modern Southeast Asia, a frontline of two of the most important global conflicts: the struggle between a declining West and a rising China, and that between religious tolerance and extremism. Southeast Asia accounts for sizeable chunks of global investment and manufacturing capacity; it straddles essential lines of trade and communication. Whether it is mobile phone parts or clothing and accessories, Southeast Asia is a vital link in the global supply chain. But what lies behind economic success? Peering beyond brand new shopping malls and the shiny glass towers of Bangkok and Jakarta, Blood and Silk highlights why Southeast Asia is one of the most perennially unstable regions of the world and reveals the true struggle of its people’s lives, the brinkmanship played by its leaders, vivid portraits of the personalities who pull the strings, and the many issues that have a global impact from the Islamic jihadist groups of Central Java to the right-wing Buddhist nationalists of Rakhine State in Myanmar. How will the deepening religious divisions in Indonesia and Malaysia affect the world? What are the global implications of China's growing influence in the region? Why is Malaysia riddled with corruption? Why do Myanmar, Thailand and the Philippines harbour unresolved violent insurgencies?